When Poppy came home from pre-school feeling tired, little did we know what was to come. A chest x-ray, an ultrasound, numerous blood samples, a blood transfusion, a transfer by ambulance and a bone marrow aspirate under general anaesthetic. All between Sunday and Tuesday. On Wednesday, just one week after Poppy had slept off her adventures at Forest School, we received the news that she had Leukaemia. Chemotherapy started the very next day and so began two years and three months of treatment. Treatment which is being provided by the wonderful NHS, a kindness which is bigger than I'll ever be able to put into words. I've always been proud of Graham being a nurse, but never more so than now. Despite the free of charge treatment, there are still many immediate additional costs to consider...the petrol, parking and other general expenses associated with traipsing back and forth to Gloucester and Bristol. Not to mention the mounting food bill which comes from putting a 3 year old who already has a good appetite on steroids! In time, we'd like to turn this into a fundraising page to give back to the amazing people who've helped us and the many other families facing this illness every day. But right now, we're still getting daily messages from the wonderful people around us who are looking for ways in which they can help. The idea behind this campaign is to aim those kind offers in the same direction, allowing us to access some lovely, family adventures when the timing is right. Love isn't measured in money. Give what you can afford and what feels right for you. As many of you will know, our "Tesco man or lady" visits so often that Poppy could read the word Tesco before she recognised the letters in her own name! So "Every little helps" applies here more than ever. We've also compiled a separate list of ways to help which require your time and skills, not your money. "It takes a village to raise a child" and as a family, our lives will be richer for the experiences you can bring to the strong foundations we've already built. Thank you so much for all the continued support we’re receiving. You have all helped ease our worries, at a confusing and overwhelming time of our lives, as we strive to find our way through this new adventure. Last week marked three months exactly since Poppy began her treatment. 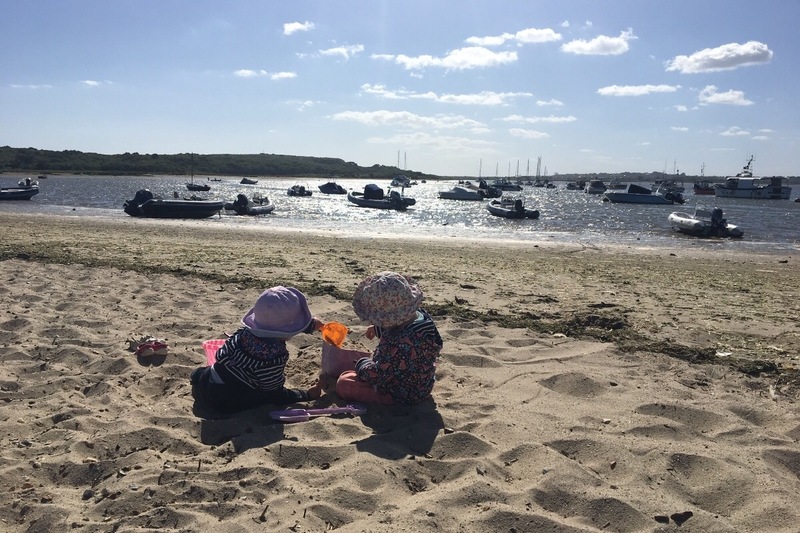 The very nature of Poppy’s diagnosis makes us want to live every moment and enjoy the little things in life, like ice creams at the seaside and toddlerchinos at the cafe. They might seem like small things, not strictly necessary in the same way as paying bills, but it’s the little part of the days that Poppy enjoys and after everything she endures daily, we want to make the rest of her memories as pleasurable as possible. Graham is working part-time, enabling me to stay at home and care for the girls. Without your support, money would almost certainly be nearer the forefront of our minds and we would need to plan carefully for a tight budget. These funds (with fun being an apt part of that word) allow us to throw caution to the wind a little and make decisions in the moment, not on a spreadsheet. Thank you truly for each donation you have made, knowing you are supporting us gives us great comfort as we tread this bumpy path. Poppy gained a small amount of movement last week, along with a more Poppy-like mood as the effects of the steroids began to wear off. A new course began this week so the brief respite in between was very welcome. 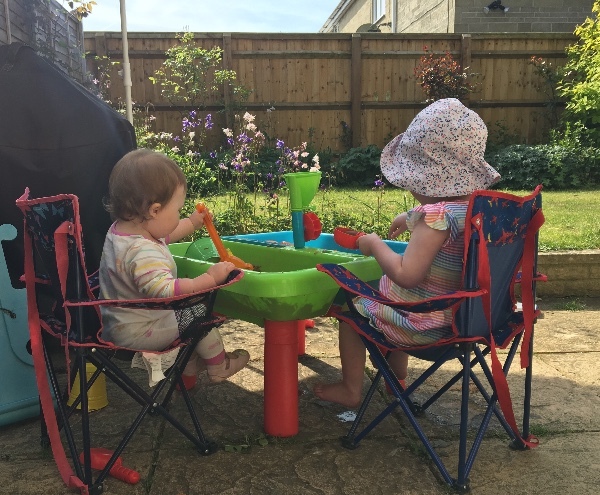 The double buggy continues to bring us daily joy in the form of days out to Westonbirt Arboretum, Barnsley Garden Festival and the local school fete amongst small walks in the sunshine around Fairford. Poppy’s been feeling brighter since receiving a blood transfusion and finishing her course of steroids, so we’ve been able to have a few family adventures. We made our first purchase from these funds this week: a double buggy to make getting out and about easier and more comfortable. Seated side by side, the girls have a good view of what’s going on and can also interact with each other. 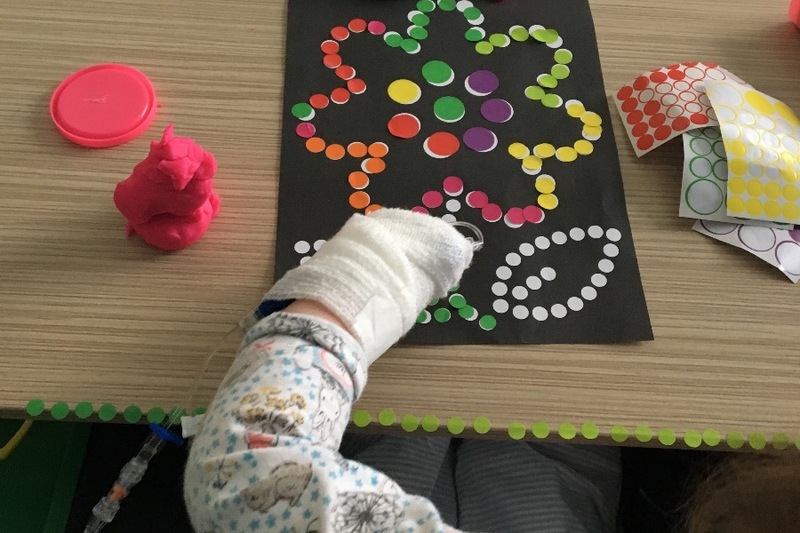 Our weeks are often disjointed, spending time in hospital and apart from each other, so it’s important to us that they still get plenty of time together too. Yesterday, we took the new buggy for a test run at the wildlife park and it made for a very smooth ride! Thank you to everyone who has made a donation, we are astounded by your generosity. Wheeling our two girls around yesterday, we were constantly reminded that this purchase was made possible by the love and kindness around us. 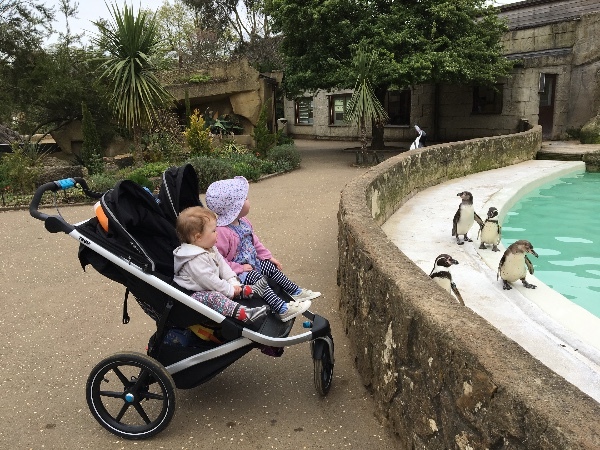 A double buggy adventure to see the penguins! Thank you so much to everyone who has donated and helped us to reach our target in just 8 days. We’ve been enveloped in so much love and been buoyed by the incredible kindness shown to us. Poppy’s not doing many of the things she liked doing before this began, but one thing she is still really enjoying is going out to eat. We haven’t touched this money yet, but it feels like a giant, security blanket (or “snuggle” as they’re known in our house!) At the moment, just knowing it is there if needed is enough to take the edge off the additional costs we’re facing. We weren’t joking about the mounting food bill! We’ve also decided to set a new, significantly higher target. We’re astounded that 32 people raised this amount in just over a week and know of so many others who still want to donate. We’ve got a long road ahead with so many unknown paths to cross, so this new target is a long term one to keep us motivated throughout the course of Poppy’s treatment. We’ll look after Poppy first, and once she has been provided for, we will turn our thoughts, existing donations and further fundraising efforts to the many other families facing Leukaemia. We hope you understand. We wouldn’t dream of being greedy and will only take out what Poppy needs before extending this kindness to others that will benefit from it.